[prMac.com] Valcea, Romania - Global Web is proud to announce the release of goPanel 1.0.3, an important update to their comprehensive remote Unix server management app for Mac OS X. goPanel allows any Mac OS X user to remotely connect, setup, and administer an unlimited number of Unix-based web servers, for one low price. Cloud Servers, also known as Virtual Private Servers (VPS) are as affordable as a shared webhosting package, and make an attractive choice for users wishing to host multiple websites or who are needing more server resources for themselves. The disadvantage of this method is that management is also the responsibility of the user, as well as the configuration of any web servers. goPanel promises to make this task more convenient, and easier to accomplish. goPanel offers complete system administrator capabilities, making it easy to install and configure Apache, PHP, MySQL, FTP, domains, and email services on an unlimited number of servers, all via an easy to use native OS X interface. Users must not install any software on their servers, as all software is installed and used from the Mac desktop. Setting up a server to host websites is a 5 minute process using goPanel. One feature of goPanel that is sure to be attractive to administrators is its low cost. Popular server management package cPanel, (which has to be installed on each individual server), is a subscription software package, which runs $379 per year, per server. goPanel, which is available for a one time purchase fee of $19.99, (for a limited time), needs only be installed on one Mac computer, and then allows users to administer an unlimited amount of servers! "Until we brought goPanel to the Mac App Store, server administration was both more expensive, and more complicated than it needed to be," says Global Web director Mihai Marica. "But now, all a system administrator needs to do is install goPanel on their Mac, and they're ready to manage an unlimited number of web servers, no matter where they are located!" goPanel is the low cost alternative to expensive control panel software that must be installed and configured on each individual server. 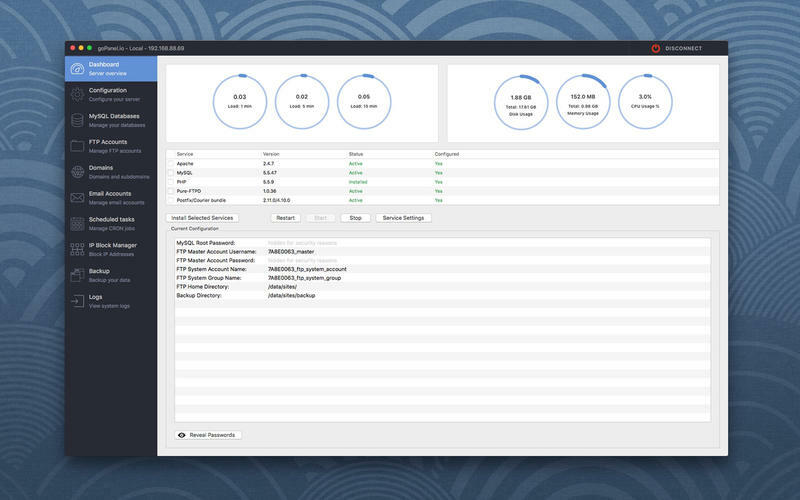 With goPanel, the process is simply, install the application on one Mac, connect to the server containing the fresh Linux distribution, and begin installing and configuring a new webserver, all via an easy-to-use interface. GoPanel saves money, saves time, and eases frustration. goPanel 1.0.3 is $19.99 USD (or an equivalent amount in other currencies) for a limited time, and is available worldwide exclusively through the App Store in the Developer Tools category. The app will return to its usual price of $38.99 at the end of the promotional pricing period. Review copies are available upon request. Located in Valcea, Romania, Global Web is a privately held company that has specialized in designing and hosting websites and managing servers for its clients for over 5 years. From their years of experience in the industry, Global Web realized the need for low-cost, comprehensive alternative to traditional, costly server control software. All Material and Software (C) Copyright 2016 Global Web SRL. All Rights Reserved. Apple, the Apple logo, Macintosh and Mac OS X are registered trademarks of Apple Inc. in the U.S. and/or other countries. Other trademarks and registered trademarks may be the property of their respective owners.